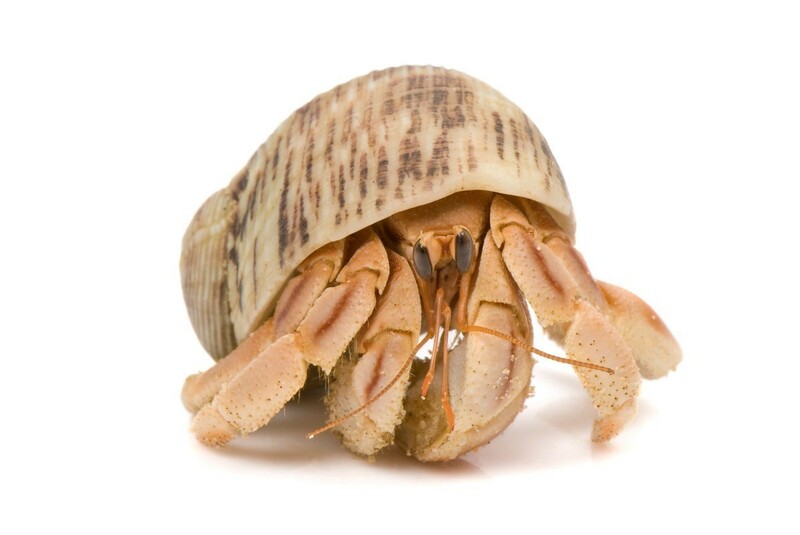 Hermit crabs are a popular pet, but also can be found at many beaches and seashores. This guide contains hermit crab photos. Alex and Alisha are Pacific Pincher and Ecuadorian land hermit crab. I got them last week. They like to bury under objects, sit in the baths in its cage, walk at night all over the crabitat and come out and say "hi." They are great! This is Tiny. I don't know how old he is, I got him from a pet store recently, and they couldn't tell me how old he is. He is a Purple Claw Crab, due to the very large purple claw that he uses for pinching. I have never been pinched, due to carefully handling him; crabs pinch when they are afraid of being dropped. I bought him from a pet store about a month ago. I was intrigued because he was so much larger than the other two crabs that I have at home. He likes to dig under the 1/2 coconut shell that I have for him in his crabitat. I am just learning about how to take care of hermit crabs, and am having fun researching all the things that make a hermit crab "tick", so to speak. My husband and I frequently travel to the beach to look at the tide pools since this in one of my absolute favorite things to do. On one such trip, we were hiking the trails of Shore Acres State Park. I'd actually never been past the beach they have there before this day. Upon finding that out (he'd never traveled past the beach, either), my husband led us across the rickety bridge and up into the woods. From here, there were amazing views of the ocean and horizon. You could even see the whale-watching center located in the entrance of the park. The waves that day were AMAZING! So high that even on top of the cliffs we were standing on, we'd get splashed every once in a while. After a while, we found an area safe enough to shimmy down to a small, rocky area and watch the waves from a closer distance. While down there, my attention eventually turned to the little critters you could see skittering to and fro. When I got home and saw the picture of this hermit crab, I couldn't believe it. His face looks so weird. Cute, but weird just the same. I definitely wanted to share it with you all and even get your take on it. Can you believe this little guy? Just another of God's wonders! 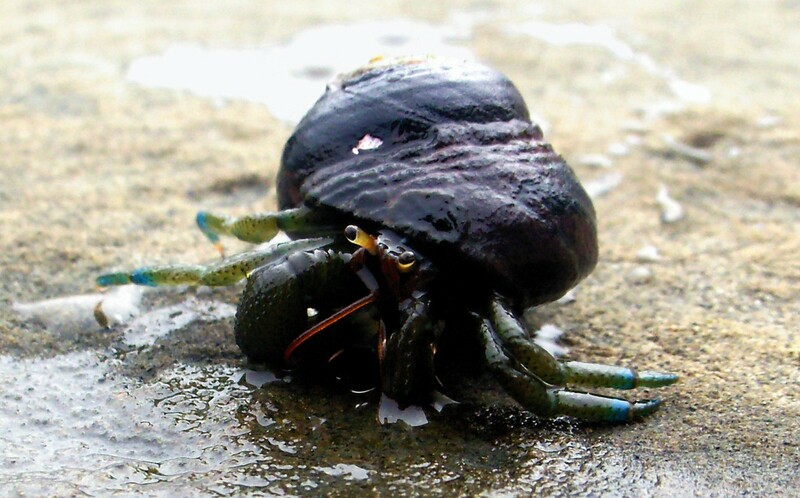 One of my absolute favorite critters to find in tide pools are active hermit crabs! These little guys are so much fun! I love the way they skitter sideways with their long eyeballs popping out from under their shell!